1. 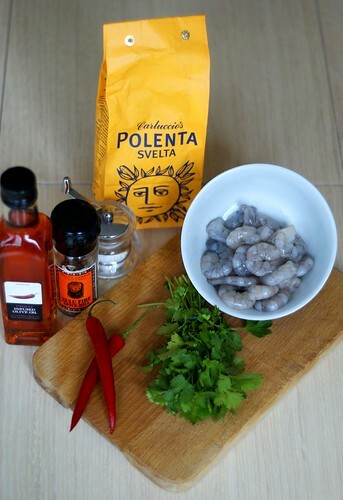 Combine about 2 tbsps of chilli oil, the coriander, chilli, garlic & prawns in a bowl. Mix around thoroughly and season a little. Leave to marinate. 2. Cook the polenta – now I can’t give you exact measurements here because I do it to eye, but for 200ml of water/stock you need about 1/2-3/4 cup of polenta. You want it to be thick enough that it absorbs the liquid, but not so thick that it clumps together. You can thin it out with a little water if this is too much polenta. I like to use Carluccio’s quick-cook polenta because it’s quicker than regular and a pretty good bargain for a big ol’ bag. I also cheat and use a stock cube because I don’t have the time/patience/storage space to make my own stock from fresh. If you have fresh stock – use it. Either vegetable, chicken, beef, veal – whatever you like – will do. When the polenta is cooked take it off the heat and add a knob of butter and stir through. You can also add a tiny bit of milk/cream/cream cheese if you want it a little creamier. I recommend it a little creamier. Yum. Season to taste. 3. In a separate pan, fry the prawn/chilli/garlic/coriander/chilli oil mixture for 2 mins MAX. They should be pink on the outside but still retain their crunchiness. 4. 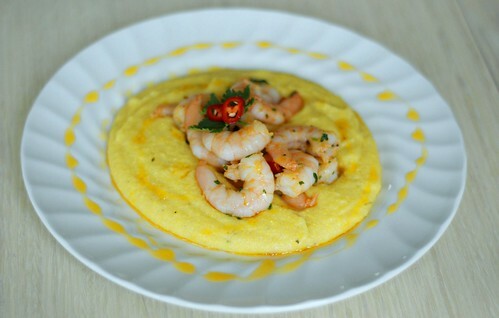 To serve, plate the polenta, then top with the prawns, some fresh coriander and a good drizzle of chilli oil. Yummies. Off to Nottingham this evening for some final graduant celebrations and the dreaded results on Thursday – wish me luck! Until next time, peace and love. Jax, Wow! That plate of food is breathtaking. The yellow against the white? Just gorgeous. Thanks for sharing such pretty photos and a great recipe. OMG I love praws – seafood!!! Are you a cook? Damn, loads of scrumptious food! Monet – thank you for your lovely comment =) I got a new toy recently, a squeezy bottle, but you can see where my unpracticed hand messed up the presentation a little… whoops! Eric – I love seafood too, especially in the summer months. Sooo perfect for hot weather, right? I'm not a professional by any means, but I love food. And cooking. And, er, eating. Thanks for dropping by!